Since the beginning of X-Labs, the group has been fascinated with aerospace technology. The first major club project was the design and creation of a High Altitude Balloon Payload. This beginning project was called X1 and it was a tremendous success. X1 traveled above 70,000 feet reaching near space and sending back live video over most of it's trip. While X1 was not recovered, it still started a quest to accomplish greater goals regarding High Altitude Balloons. Working on the wave of success with X1, X-Labs began the X2 Obara High Altitude Balloon mission. X2 Obara was another basic high altitude balloon consisting of an APRS tracker and GPS from byonics as the tracking system, a simple homebrew RF beacon for directional tracking, and a camera with a timer. The day X2 was launched, the X-Labs recovery teams watched from various positions around Florida as X2 drifted off the coast of Melbourne into the Atlantic. We thought we had lost X2, but the next day a mother of a USF student walking the coast of Melbourne found the tattered remains of X2 washed up on shore! The SD card in the camera was still good and we had successfully retrieved high resolution pictures from the edge of Space! X-Labs quickly began work on X3 with a short time frame due to requests from various media outlets. We designed a payload that looked like the Apollo capsule in an attempt to improve X3's stability in case of a water landing like X2. X3 was loaded with electronics including our normal camera with timer and APRS tracking system, but also with the addition of a sensor board which data logged temperature, pressure, and accelerometer data to a flash drive. Unfortunately, disaster struck when we released X3 on launch day only to realize that the tracking system was not functioning correctly! X3 was lost before it's journey even began. 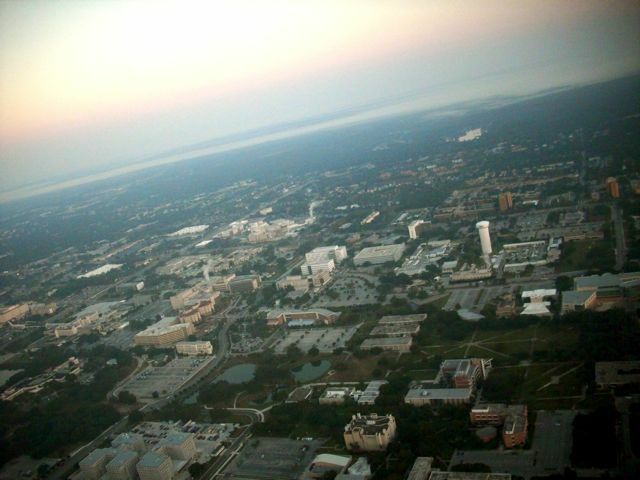 After X3, several vital X-labs members graduated and moved away from USF. This put a hold on the High Altitude Balloon projects for a couple years, but X-Labs is back and growing again. We are starting our fourth balloon project and it will be our most advanced system yet! Please check out the X4 UAV on it's own dedicated pages now!